These mustard seeds aren’t spicy until they are cracked and mixed with a liquid—generally wine or vinegar. Photo of mustard seeds by Magda Skale | SXC. VICTORIA MARSHMAN is an intern at THE NIBBLE. 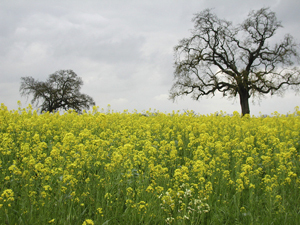 Mustard grows wild; food historians believe it was first cultivated in India around 3,000 B.C.E. 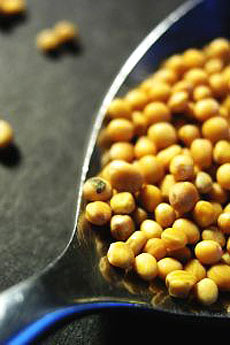 Mustard seed is mentioned in the Bible: The Hebrews used mustard for cooking, and Abraham is said to have served cow tongue with mustard—a delicious combination that can be found today at a good delicatessen. The Greeks used mustard as both a condiment and a medicine: The mathematician and scientist Pythagoras (570-ca. 490 B.C.E.) prescribed it for scorpion stings and the pioneering physician Hippocrates (460-377 B.C.E.) used it as a medicine and for poultices, a use that continued until recent times as mustard plasters. According to Colman’s Mustard, an early reference to the potent nature of the mustard seed was in exchange between King Darius of Persia and the young Alexander the Great (356-323 B.C.E.). Darius gave Alexander a sack of sesame seeds to represent the number of men in his army, and Alexander responded with a sack of mustard seeds to represent both the number and the fiery nature of his army. Wild mustard. Photo by R.Roscoe |Morguefile. *The Roman expansion into northern Gaul occurred from 58-51 B.C.E. under Julius Caesar. As early as 125 B.C.E., the Romans had intervened in Gaul to assist the people of Massilia, who were under attack by the Gauls. In the 4th century C.E., Gaul’s eastern frontier, along the Rhine, was overrun by Germanic tribes, principally the Franks, leading to the ancient name of “Francia” for the area around Paris, which evolved into the name for what became the monarchy of France. By the 9th century, French monasteries were generating considerable income from mustard sales. By the 13th century, Parisian merchants included mustard among their daily sauces for sale. 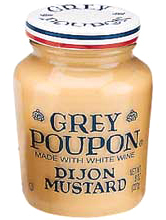 Pope John XXII of Avignon (1249-1334) loved mustard so much that he created the post of “Grand Moutardier du Pape” (Grand Mustard-Maker to the Pope), and gave the job to an idle nephew who lived near Dijon. 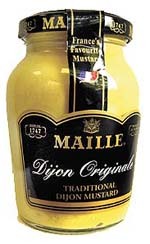 Dijon soon became the mustard center of the world. Mustard-making was so important that in 1634, a law was passed to grant the men of the town the exclusive right to make mustard. England’s Keen & Sons was founded in the same year as Maille; but the most notable English mustard-maker did not come along for another 50 years. 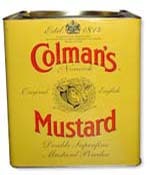 Jeremiah Colman, a miller, initiated clever business practices that led to the establishment of Colman’s Mustard of England in 1814, and would make his name synonymous with mustard. He perfected the technique of grinding mustard seeds into a fine powder without creating heat, which evaporates the oil, and the pungent flavor along with it. In 1866, Colman was appointed mustard-maker to Queen Victoria; the proclamation and coat of arms are at the top of the can. Despite the wide acceptance of mustard and the regulations governing its production, its popularity declined by the early 18th century, partly because of the attraction of new spices available from the Far East. The mustard market was revived in 1856, however, when Jean Naigeon substituted verjus for the vinegar in prepared mustard. The result—a smooth, less acidic mustard. Dijon once more became the undisputed capital of the once-more-beloved condiment.